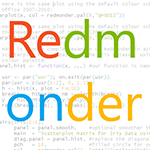 Redmonder is a package for the statistic language R. A fork of the popular RColorBrewer package, Redmonder allow users to apply to their plots colour schemes inspired by Microsoft applications such as Office and Power BI. The fundamental diference between RColorBrewer and Redmonder is the included color palettes. RColorBrewer is based on the design principles established by the Color Brewer project, while Redmonder does not. Redmonder is not designed as a replacement for RColorBrewer, but as an alternative for when the design principles of ColorBrewer are not required. The following short video (<8 min) provides an introduction to the Redmonder package, which starts at 1:00. Redmonder is available at GitHub and can be downloaded here.